With contact and translaminar movement, TetraSan controls spider mites on the underside of leaves, even when it's difficult to get good under-leaf spray coverage. TetraSan has a unique mode of action, offers residual control up to five weeks and is safe to most beneficials. TetraSan 5 WDG is a miticide that controls major tetranychid mite species in egg and nymph stages of growth. 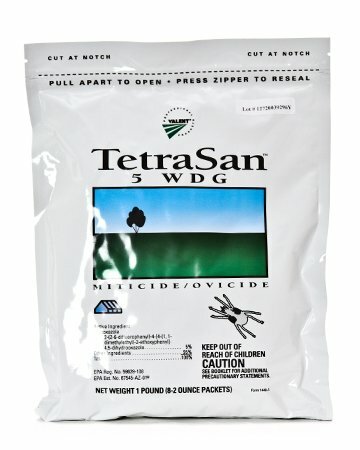 Foliar applications of TetraSan 5 WDG can be made for control of spider mites infesting indoor (greenhouses, lathhouses, shadehouses and interiorscapes) and outdoor ornamentals, including flowering and foliage crops, ground covers, shrubs and ornamental trees, non-bearing fruit and nut trees, and Christmas trees. TetraSan 5 WDG may be used in ornamental production areas and in the landscape in residential and commercial areas. MULTIPLE PACKAGING This bag contains multiple water soluble packets of TetraSan 5 WDG. Do not handle the packets with wet gloves or allow the packets to become wet prior to addition to spray tank. Do not break open packets. Each packet contains 2 oz (1/8 lb) of TetraSan 5 WDG. If all packets are not used, close and reseal outer container to protect remaining packet(s). If you have any questions about this product by Valent Professional Products, contact us by completing and submitting the form below. If you are looking for a specif part number, please include it with your message.